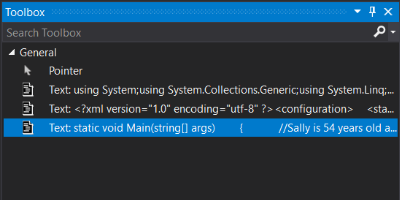 Did you know you can use the toolbox in Visual Studio as a visual clipboard? Just drag and drop (or paste a copy) selected code in the toolbox window. You know that window that usually contains graphical elements. If you need to organize them you can change the listing name as well as search among them.